Archery – 40 years all styles and disciples and still LOVE IT! Baseball – 10 years Pitcher 3rd and Catcher 13 Ks in 6 innings at a State All Star game. Crazy knuckle ball (fingertips) fast and slow curve with a crackin fastball. Coach and Umpire. Football – 8 years Inside LB, Nosegaurd Fullback w Darrin Barry! Wrestling – 2 years 2 pins at State. Fishing – every stream lake and puddle I could find in the NW! Trout Bass Stealhead Salmon. Hunting – everything in every way and every chance I can…Archery Shotgun Rifle Rocks… you name it. I’ve hiked hunted and fished in every County in Washington and have bugled Bull Elk from here to Montana! 1982 Received my first compound bow and lessons from the Legend and family friend Mr Glenn St Charles. My mother and I were the very first two to own the Bucksin compound and these were both signed #1 and #2 originals from Glenn. These were Glenn’s first production compounds!! Started Bowhunting, Training retrievers for field trials/waterfoul hunting and continued to compete in local archery events till 16 years old. 1987 My Family opened The Nock Point Archery Range. 1988 Compound Freestyle!! 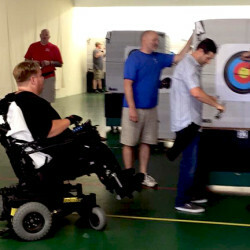 Started taking Professional lessons from Bob Anderson (Browning Pro) and legendary Archer Frank Pearson (Browning Pro). Frank is the only Archer to ever be on a Wheaties box! 1988-1990 Traveled to every single archery event I could as a Nock Point staff shooter with sponsors from Browning Martin and Easton. I competed in archery events across the PNW as a YA and I managed to win every event I entered in those two years (besides the carp derbies (Darrins fault we lost:) I also competed with BB Recurve, Traditional longbow and BHFS equipment. 2000 Started working with DVR on PASS Plan to start driving and GET BACK TO WORK! 2005 Started driving again (I’m FREE!!) and started Next Step Archery! One of my most ambitious goals is to create and build a Archery Center of Excellence! 70m indoor range that will be large enough to host World Class events and will be a multi sport center for everyone in our community to enjoy. Another goal is to teach valuable life skills through the Art of Archery as well as help Archery grow in the PNW. Bringing Archery back to Seattle Parks. Archery was banned in the Parks since 1981 and in 2011 NSA held a tournament at Jackson Golf course. The City of Seattle is now recognizing Archery as a SAFE and popular activity and we will see more progress with Archery in the Parks in the near future! • Accidentally drove my wheelchair off the side of a cliff while Elk Hunting! OUCH! • I like playing chess, cribbage, slap jack, the slap game, knuckles, slug “Ford” and sock ball. I love to watch the 55 and older baseball games in person.